Will my programme help me to reach my goals? Is there any additional financial support provided by the university? How much do I have to pay for my university housing? Students often have these or similar questions, but do not know whom to ask. 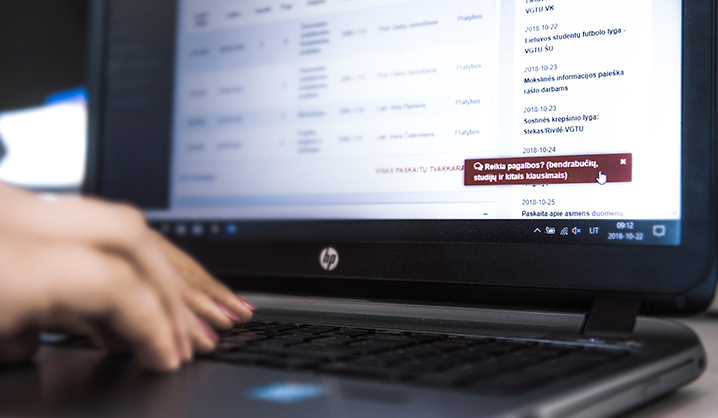 We would like to remind you, that you can post any questions related to studies and studying at Vilnius Gediminas Technical University (VGTU) by login in to your personal account on Mano VGTU portal. Students should click the red button on Mano VGTU portal “Need help? (dormitories, studies and other issues)”. Students can post their questions in the new window that pops up: you should choose a category and post your questions. When you choose a category, your question will be sent directly to the university’s employee who is responsible for the topic. They will answer your questions or will take action to solve your problem. If you have a question which does not fall under any of the categories, do not hesitate to ask. In such case we will forward your question to the university’s employee who can help you. Feel free to ask anything that bothers you. VGTU’s administrative staff wants you to be an active member of the university’s community and is happy to help!